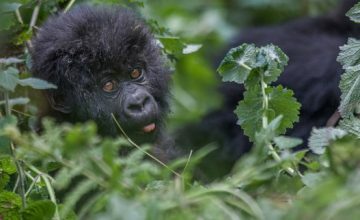 The 9 Days Rwanda Gorilla safari is designed to enable you explore the wildlife, culture, primates and scenic offerings of Rwanda as a safari destination. 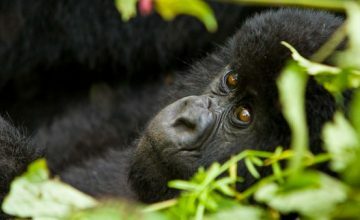 This 9 days Rwanda safari involves Kigali city tour, wildlife viewing and boat cruise in Akagera National Park, Cultural and heritage encounters in Butare, Chimpanzee trekking, colobus monkey tracking and Canopy walk in Nyungwe Forest National park, Gorilla trekking in Volcanoes National Park and an option between golden monkey tracking, Hiking Dian Fossey site or Hiking the Bisoke Volcano. It a combination of various adventures both passive and active that will generate ultimate safari memories. 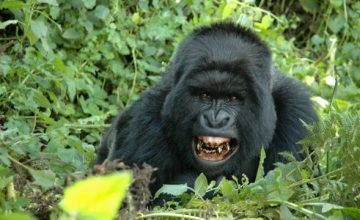 Day 9 of the 9 Days Rwanda Gorilla Safari: Do golden Monkey tracking/ Hike Bisoke/ Hike Dian Fossey site & transfer to Kigali city. Kigali – the capital of Rwanda is a lush city free of traffic and pollutant noise. It is a cozy environment that one may not expect in African cities. In its calmness, it has got rich heritage which is highly shaped by the effects of the 19994 genocide. After breakfast, you will embark on the tour of this city visiting sites like the Gisozi genocide memorial, presidential Palace museum which was the home of the then president Juvenal Habyarimana who lost his dear life in a plane clash and the remains of FALCON 50 lay in the compound to justify this tragedy. The tour also exposes you to the Natural History Museum, craft centers in Kigali, Kigali down town, Hotel Des Milles Collines – the scene for the movie Hotel Rwanda among other Kigali city landscapes. Accommodation: Kigali Serena Hotel (Upmarket/luxury), Hotel Chez Lando (Midrange/standard) or Murugo Rwanda Hostel (Budget/basic). 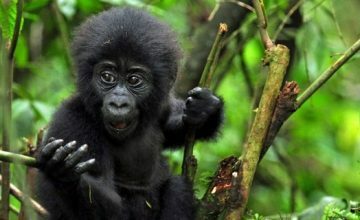 After breakfast, transfer to Akagera National Park 130km about 2.5 hours’ drive from Kigali. 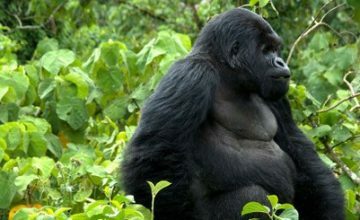 You will pass through the farmed hill sides of Rwanda before approaching the relative lower lying landscapes of eastern Rwanda where Akagera National Park is situated. You will arrive early for lunch and short relaxation after which you will embark on the relaxing boat cruise on Lake Ihema which is the second largest Lake in Rwanda. The sights of Nile crocodiles and Hippos not forgetting wild game drinking on the Lake side will combine your boat trip rewarding. You will wake up early enough for a cup of coffee before embarking on the game drive in the National game park of Akagera. The early departure gives you chances of spotting early risers and night hunters retreating to their hiding places. The drive will expose you to wildlife like Zebras, giraffe, elephants, Antelopes like Impala, waterbuck among other wildlife. The scenic landscapes of the Akagera plains and overlooking Tanzanian plains also make sightseeing rewarding on this trip. Return to the lodge for relaxation till lunch after which you will embark on the transfer to Butare 247km approximately 4 hours’ drive for overnight. 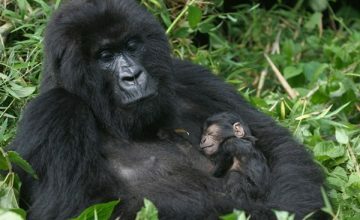 After breakfast, embark on the tour of the Butare area. You will pay a visit to the Nyanza palace which was a home of King Musinga and his successor King Rudahigwa. The site has a unique hut crafted in traditional architecture while the traditional Inyambo cows are around the site thus can be seen on this Rwanda safari. You can also visit the Ethnographic museum which is the largest in Rwanda with over thousands of artifacts and the genocide memorial sites in the area. 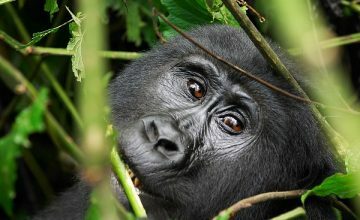 You will have lunch in Butare after which you will transfer to Nyungwe forest National Park 155km about 3 hours’ drive. Arrive in the evening for overnight. Accommodation: Nyungwe Forest Hotel (Upmarket/luxury), Nyungwe Hill Top View Hotel (Midrange/standard) or Gisakura guest House (Budget/Basic). 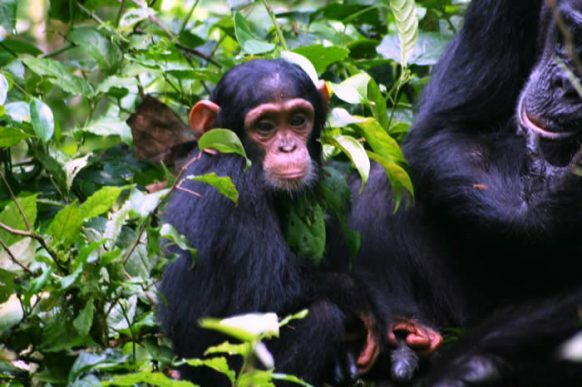 After breakfast, embark on the Chimpanzee trekking experience that starts at 08:00am. 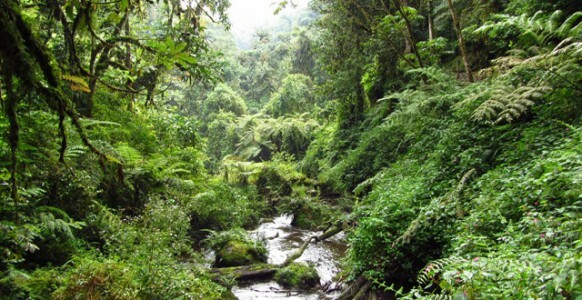 You will set off to the montane forest of Nyungwe which is praised to be among those few forests that survived the last ice age in search of man’s close relative – common chimpanzee. 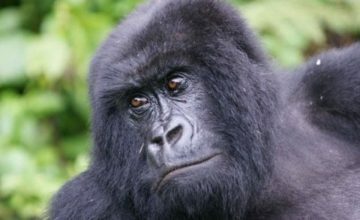 The 2 -5 hours trek is very interesting as it involves passing through the jungle, hiking steep landscapes and descending on the same terrain amidst bird sights and other wildlife including monkeys. Upon encountering Chimpanzees, you will marvel at their intelligent tactics, how they gather fruit, swing in tree branches, socialize and their general characteristics for one full hour. After this, you will return to the lodge for relaxation. In the evening, you will pay a visit to the surrounding communities to see how local people have crafted their livelihoods from farming and tea growing. Traditional performances are also arranged. After breakfast, set off for colobus monkey tracking in Nyungwe forest where you have chances of encountering the largest grouping of colobus monkeys in Africa. The colobus monkeys appear in their white and black coat and their appearance makes them unique and worth of trekking. The colobuas monkey tracking on Rwanda safari is beyond colobus monkeys as it involves trekking through the jungle full of birds and other wildlife species, the raising landscape of this mountain forest add spice to this colobus monkey tracking experience. It takes 2 – 5 hours and involves one full hour encounter with Colobus monkeys. In the afternoon, you will embark on the rewarding Nyungwe canopy walk that takes you through the views of the Nyungwe forest canopy that is filled with birds and primate species like monkeys. 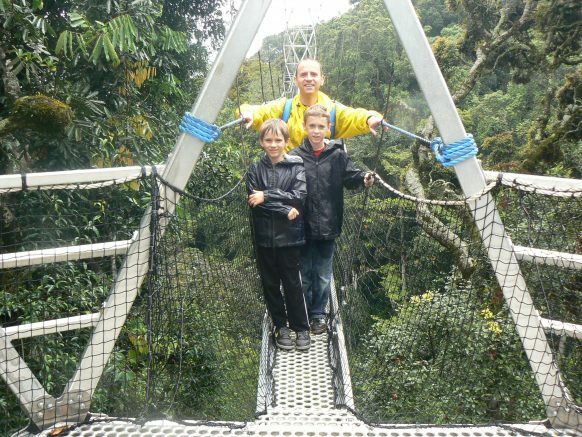 The 90m long and 40m high Nyungwe canopy is an exciting adventure to undertake on Rwanda safari. 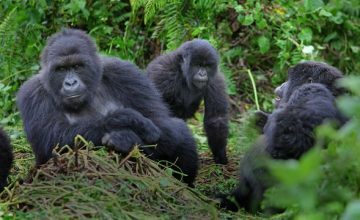 After breakfast, embark on this long journey drive to gorilla trekking haven of Volcanoes National Park 338km about 9 hours’ drive from Nyungwe. The drive involves amazing scenic views of Lake Kivu en route and farmed hill sides of Rwanda. You will have lunch en route and arrive in Volcanoes National Park in the evening for relaxation and overnight. 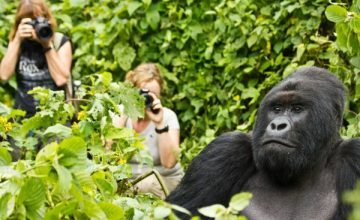 Day 9 of 9 Days Rwanda Gorilla Safari: Do golden Monkey tracking/ Hike Bisoke/ Hike Dian Fossey site & transfer to Kigali city. After breakfast, you can choose to you can choose to do golden monkey tracking to encounter the rare and endangered golden monkeys that only dwell in the Virunga volcanoes. The activity takes about 4 hours and starts at 08:00 from the park headquarters – Kinigi. The trek involves passing the lush vegetation of Volcanoes up to the Bamboo zone where the golden monkeys prefer to dwell. Upon, reaching them, you will marvel at their golden skins and their distinctiveness from other monkey sub species. 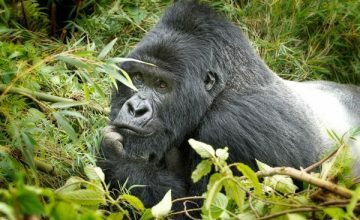 Alternatively, hike Dian Fossey site. 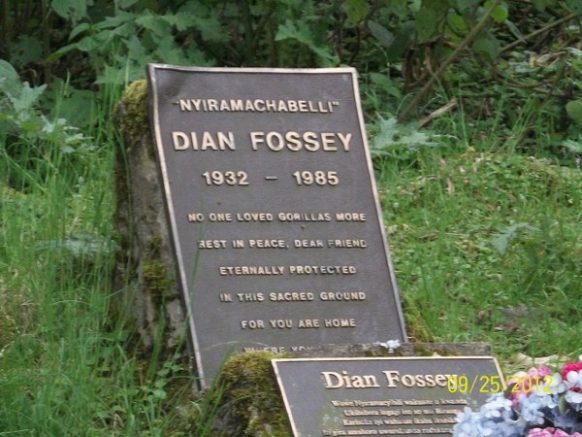 The hike to Dian Fossey center to pay tribute to one of the gorilla conservationists the world is proud to have had is an interesting activity. 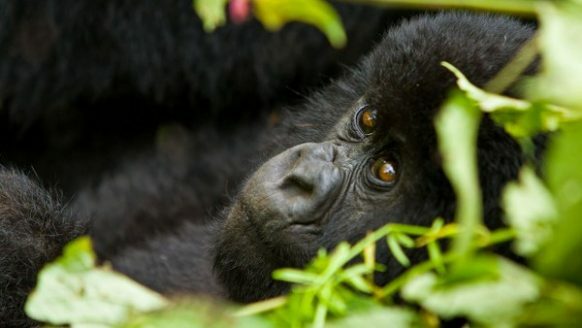 This American Primatologist championed for the conservation of these critically endangered mountain gorillas. The Karisoke center is located at a raised land scape thus involves a relative hike but less strenuous. The grave of the Silverback digit is also seen at this center. The activity takes 3 – 4 hours. Another option is hiking Bisoke Volcano which takes 7 hours round trip. It involves a relative hike and like any other mountain, it involve step ascend at certain levels. 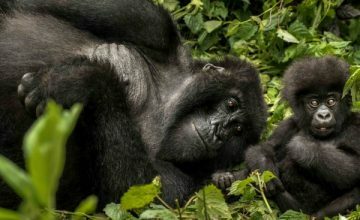 Hiking this volcano exposes you to various vegetation covers, wildlife including monkeys, bird species while its summit offers views of the entire Virunga volcanoes and Democratic Republic of Congo. You will return from any of these activities to the lodge for lunch after which you will embark on the transfer to Kigali 116km about 3 hours’ drive.